The CIVITAS Forum Conference 2019 will be held in Graz, Austria, from 2-4 October 2019. The 17th edition of Europe's top sustainable urban mobility event will gather the leading figures in the field from across the continent and beyond. This varied group of city representatives, practitioners, policymakers and academics will debate and analyse the most pressing mobility topics and witness the pioneering solutions bringing cleaner, better transport to Europe. Registration and the calls for contributions, exhibitors and sponsors are open. Attending the event is free. This year's location of Graz marks something of a CIVITAS homecoming - the very first Forum took place there in 2003. Yet mobility moves fast. The reality in Graz now is vastly different to 16 years ago, like in many cities across Europe. But how and why have things changed in this time? What has the role of CIVITAS been in this? What must be done to ensure a continued transition towards sustainable, safe and connected mobility? To examine these crucial questions, the CIVITAS Forum 2019 has chosen to go 'back to the future' and look at the interplay between new technology and classic mobility solutions in the present day. With cities turning to people-centric planning and reclaiming public space, the importance of two legs and wheels is being rediscovered. Alongside this, thematic sessions will focus on the most urgent mobility topics – many of them addressed by ongoing CIVITAS projects – and provide participants with fora to discover outstanding work from within and beyond the CIVITAS Initiative. Take-up and transfer sessions also make their return. One of the Forum's most interactive elements, they enable participants to get hands-on with cutting-edge urban mobility tools and see methods in action. Study tours, walkshops and further engaging formats are envisaged! Graz is Austria's second largest city with 330,000 inhabitants and the capital of the Province of Styria. It is an ideal place to see the intelligent application of technological solutions together with a citizen-focused mobility vision. 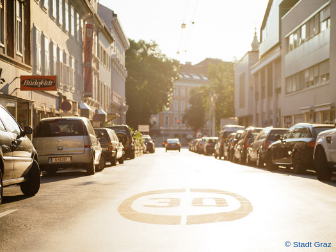 By 2050, Graz aims to be a dynamic, livable, energy-efficient and carbon neutral city. 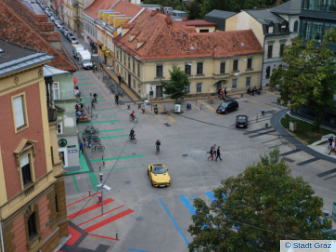 Implementing the Smart City Graz Strategy should create an ideal mix of urban usages, attractive public spaces, and a compact built environment where sustainable mobility comes first. It also has a long, distinguished track record as a CIVITAS member and for embedding sustainable ideas into its urban development and transport systems. As well as having one of Europe's largest pedestrian zones, the city was an early implementer of cycling lanes and a parking management system. It also has an intermodal hub system, tim, which enables users to access various shared mobility services, such as car-sharing and e-taxis. Site visits held at the beginning and end of the Forum will enable visitors to discover these and Graz's other mobility innovations. Book your place at the CIVITAS Forum 2019 now. The calls for contributions, exhibitors and sponsors are open - the deadline for all submissions is 31 May 2019. Submit contributions here and become an exhibitor here. Prospective sponsors should send the registration form found in the call to office@koop.at. See an outline of the draft programme here and find full details on travel and accommodation here. Follow #CIVITAS2019 on Twitter to keep up to date with the latest Forum news.